Plenty of questions remain on the Vikings roster with three preseason games to be played in the next two weeks. But some roster decisions are taking shape. Plenty of questions remain on the Vikings roster with three preseason games to be played in the next two weeks. But let’s stop for a second to take stock of where things stand, from our point of view, in between the Vikings’ exhibition opener in Buffalo and Friday’s second preseason game in Seattle. Below is our second 53-man roster projection of the summer. Teddy Bridgewater has a few weeks to return to practice before he’ll transfer to the regular season Physically Unable to Perform list, where he’ll be required to sit six games before he’s again eligible to return to practice. This projection is assuming Bridgewater will still be on PUP. Keenum to this point has been the more stable option at backup quarterback. The Vikings often keep three healthy passers on the active roster. Don’t sleep on fullback C.J. Ham, the converted running back from Duluth, but at this point the Vikings could use tight end David Morgan in a similar backfield role. Ham is eligible for the practice squad. Veteran Michael Floyd will be on the suspended list for the first four games, freeing up a roster spot for a young receiver like Adams or Coley. Both Coley and Adams have flashed some playmaking ability in this young preseason. Carter, undrafted last year out of Penn State, has been heavily involved this summer, including a TE-high 21 snaps in Buffalo, and looks poised to seize a roster spot. Hodges, the rookie, has plenty of room to grow, but his upside as a receiver could warrant a spot. This is where the roster hits a logjam with plenty of young and inexperienced linemen competing for spots. Willie Beavers, last year’s fourth-round pick, has shown some improvement at right tackle and could push Sirles for a spot. T.J. Clemmings’ move to guard also seems to suit him, but the Vikings may like the upside of Isidora instead. The Vikings kept five defensive ends a couple years ago when Justin Trattou had a strong preseason. That might be the case with rookie Tashawn Bower, the undrafted LSU product who stood out during the exhibition opener in Buffalo. Here instead are five defensive tackles after the Vikings were shorthanded at DT last season. Should a roster spot come between Stephen and fourth-round pick Jaleel Johnson, the Vikings could keep another pass rusher like Bower. Defensive tackle Will Sutton and rookie end Ifeadi Odenigbo are also in the mix. Sharrif Floyd is expected to start the season on the reserve/non-football injury list. Gedeon, a fourth-round pick, has also been heavily involved this summer. He continues to mix in with the first-team defense at weak-side linebacker, where Lamur and Robinson are also competing. All three have been fronting special teams units and are likely to make the team. Brothers (hamstring) needs to get healthy and play this preseason to hold off rookies Elijah Lee and Eric Wilson from taking a roster spot. Defensive backs (10): CB Xavier Rhodes, CB Trae Waynes, CB Mackensie Alexander, CB Terence Newman, CB Marcus Sherels, S Harrison Smith, S Andrew Sendejo, S Anthony Harris, S Jayron Kearse, DB Antone Exum Jr.
Exum Jr. has been healthy and active since landing on crutches with an injured knee earlier this spring. He’s also been revisiting the slot corner role and could be a versatile role player for the Vikings in his fourth NFL season. That’s why he’s ahead of rookie Jack Tocho, the cornerback-turned-safety, at this point. Jabari Price will get a chance to earn his spot, but the top five cornerback spots should be considered locked ending with Sherels, the dynamic punt returner. Like the Vikings ‘unofficial’ depth chart, the veterans hold the lead here in specialists competitions even though punter Taylor Symmank and kicker Marshall Koehn could supplant either. Both have strong upside, but need to show the consistency of their veteran counterparts. 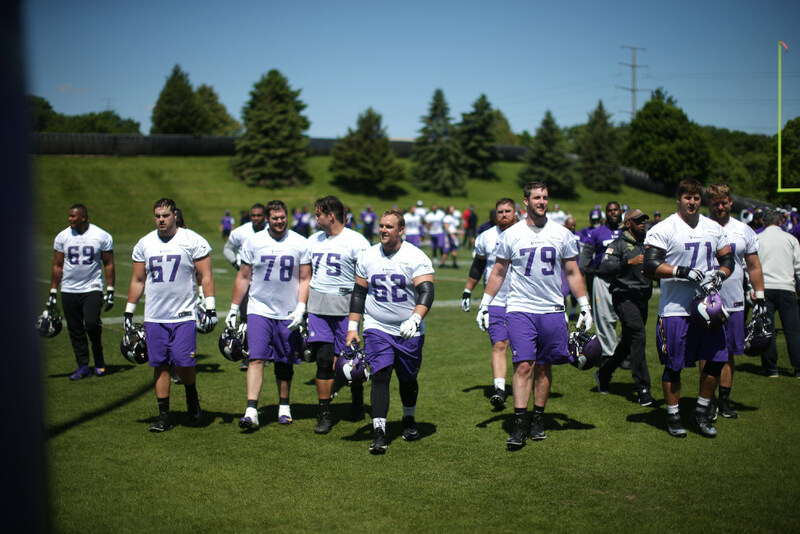 Craig: Is this a here-we-go-again scenario for Vikings offensive line?